The Kokoba corner cat litter tray fits easily into the edge of any room so your cat's got somewhere private to do their business. The Kokoba cat litter tray takes up less space than a normal litter tray, and just slots easily into the corner of the room. Like people, cats prefer a bit of privacy when they use the loo. Keeping their litter tray tucked away in the corner makes your cat feel nice and secure while they do their business. It's best to make sure the litter tray's somewhere out of the way (a busy corridor or living room can be a bit off-putting for kitty). It's also best to keep it away from their food or water bowl to keep everything hygienic. edge can be taken out for easy cleaning. This triangular litter tray has a space-saving shape to give you more room in your home. It's just the right height for cats to hop into, and has a protective edge so that they can't kick litter out (and all over your floor). The edge slips off easily when it's time to change the litter or wash the tray. It's built to last from high quality and durable plastic, which is also nice and smooth – so really easy to wipe clean. Just fill it with your cat's favourite litter and make sure to give it a scoop twice daily to remove waste. 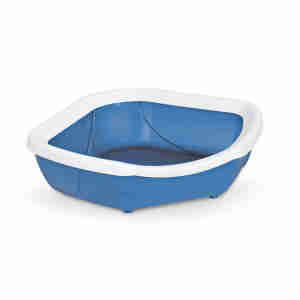 Convenient tucks nicely into corner but large enough to give cats room to turn round. Excellent size this was for an older cat 15 yrs and I observed that the cat seems more confident now.